261 Commonwealth is located on the north side of Commonwealth, between Fairfield and Gloucester, with 257 Commonwealth to the east and 263 Commonwealth to the west. 261 Commonwealth was designed by Shaw and Shaw, architects, and built in 1880-1881 by Vinal & Dodge, builders, as the home of banker Walter Hunnewell and his wife, Jane Appleton (Peele) Hunnewell. They had lived at 303 Dartmouth during the 1880-1881 winter season. They also maintained a home in Wellesley. Walter Hunnewell is shown as the owner of 261 Commonwealth on the original building permit application, dated September 9, 1880 (his brother, Arthur Hunnewell, was the original name shown, but then crossed off and Walter Hunnewell written in). Walter Hunnewell purchased the land for 261 Commonwealth on January 1, 1880, from Thomas Jefferson Coolidge. T. Jefferson Coolidge had purchased the lot on April 20, 1866, from a real estate trust formed by John Templeman Coolidge, Franklin Evans, and Charles Henry Parker. The lot was part of one of several parcels the trust had purchased on January 29, 1866, from the Boston Water Power Company. The trust had subsequently subdivided the parcels into lots, which it sold to investors and builders, who then frequently resold the lots to others. Click here for an index to the deeds for 261 Commonwealth. Jane Hunnewell died in September of 1893. Walter Hunnewell continued to live at 261 Commonwealth with their six surviving minor children: Mary Peele Hunnewell, Walter Hunnewell, Jr., Francis Welles Hunnewell, Willard Peele Hunnewell, Louisa Hunnewell, and Arnold Welles Hunnewell. During the 1899-1900 and 1900-1901 winter seasons, Walter Hunnewell and his children lived at 130 Beacon with his father, Horatio Hollis Hunnewell, a widower. 261 Commonwealth was not listed in the 1900-1901 Blue Books. Willard Hunnewell died in November of 1900. By the 1901-1902 winter season, Walter Hunnewell and his children had resumed living at 261 Commonwealth. Mary Hunnewell married in June of 1908 to Sydney Messer Williams, a note broker. After their marriage, they lived in Wellesley. Walter Hunnewell, Jr., married in January of 1914 to Minna Cornelia Lyman. 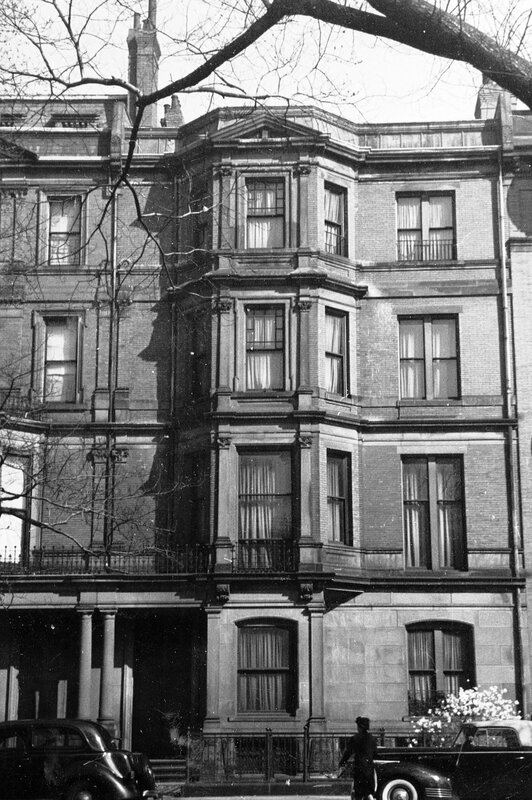 After their marriage, they lived at 173 Beacon and in Wellesley. He was a banker. Walter Hunnewell, Sr., continued to live at 261 Commonwealth until his death in September of 1921. 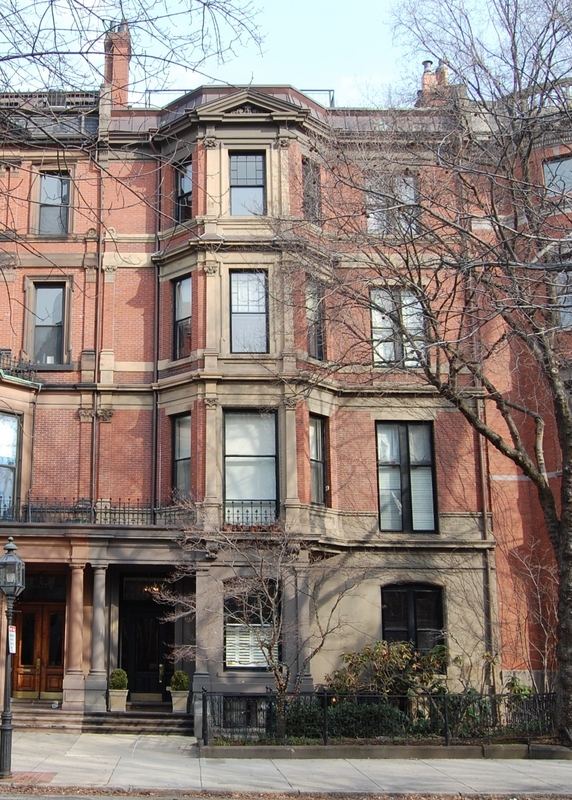 After his death, 261 Commonwealth continued to be the home of his three unmarried children: Francis, Louisa, and Arnold Hunnewell. Arnold Hunnewell, a banker, married in March of 1922 to Mary Copley Amory, after which they moved to 179 Beacon. They also maintained a home in Wellesley. On July 11, 1922, the trustees under Walter Hunnewell’s will transferred 261 Commonwealth to Francis Hunnewell and Louisa Hunnewell, who continued to live there. Arnold and Mary Hunnewell joined his brother and sister at 261 Commonwealth during the 1925-1926 winter season. They had lived at 7 Fairfield during the previous season. They continued to live at 261 Commonwealth during the 1926-1927 season, after which they moved to 129 Commonwealth. 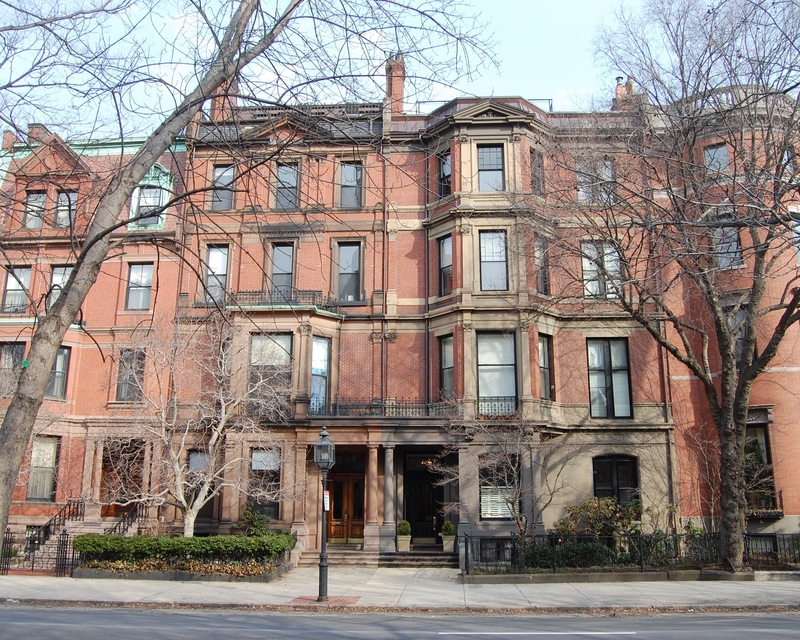 Francis Hunnewell, who was Secretary to the Corporation of Harvard University, and his sister, Louisa, continued to live at 261 Commonwealth until about 1937, when they made Wellesley their year-round home. They continued to own 261 Commonwealth. 261 Commonwealth was shown as vacant in the 1938-1945 City Directories. 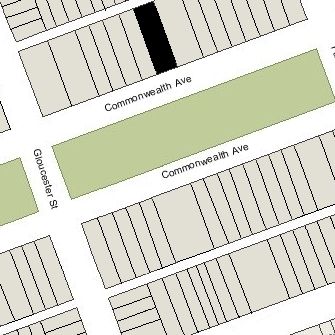 On November 10, 1944, 261 Commonwealth was acquired by Fred L. Arata, a retail liquor dealer and real estate investor, and his mother, Julia (Giulia) (Leverone) Arata, the widow of Paul (Paolo) Arata. Fred Arata and his wife, Annette Flossie (Crovo) Boggiano Arata, lived in Brighton; his mother lived with them. In November of 1944, he applied for (and subsequently received) permission to convert the property from a single-family dwelling into ten apartments (including the janitor’s suite in the basement). Julia Arata died in April of 1952 and on April 4, 1954, Fred Arata transferred the property to himself and his wife. On January 3, 1956, 261 Commonwealth was acquired from Fred and Annette Arata by Beatrice (Miller) Silversmith, the wife of Peter Philip Silversmith. He was a lawyer and real estate dealer, and maintained his office at 261 Commonwealth. They lived in an apartment at 62 Commonwealth. By the late 1950s, they had moved to Palm Beach, Florida; they maintained a Boston apartment at 326 Dartmouth and he maintained an office at 261 Commonwealth. On July 19, 1960, Beatrice Silversmith transferred 261 Commonwealth to her husband as trustee of the Peter P. Silversmith Trust. On May 8, 1961, 261 Commonwealth was purchased from the Silversmiths by Anita E. Sangiolo, the wife of Joseph B. Sangiolo, a mechanical engineer. They lived in Sudbury. On December 29, 1964, 261 Commonwealth was acquiired from Anita Sangiolo by Richard S. Kates, trustee of the E. E. Harrington and Squire Realty Trust. On the same day, he transferred the property to himself and Eliot Conviser. On January 12, 1968, they transferred the property to Eliot Conviser as trustee of the Cabot Realty Trust. By the mid-1960s, the number of apartments (as indicated in the Boston City Directories) had been increased from ten to eleven. On December 10, 1968, 261 Commonwealth was acquired from Eliot Conviser by real estate dealer J. Linzee Coolidge. On May 15, 1978, 261 Commonwealth was purchased from J. Linzee Coolidge by Kevin O’Reilly, trustee of the O’Hara Trust for Real Estate. In October of 1978, he filed for (and subsequently received) permission to legalize the occupancy as eleven apartments. On December 4, 1978, he converted the property into eleven condominium units, the 261 Commonwealth Condominium.